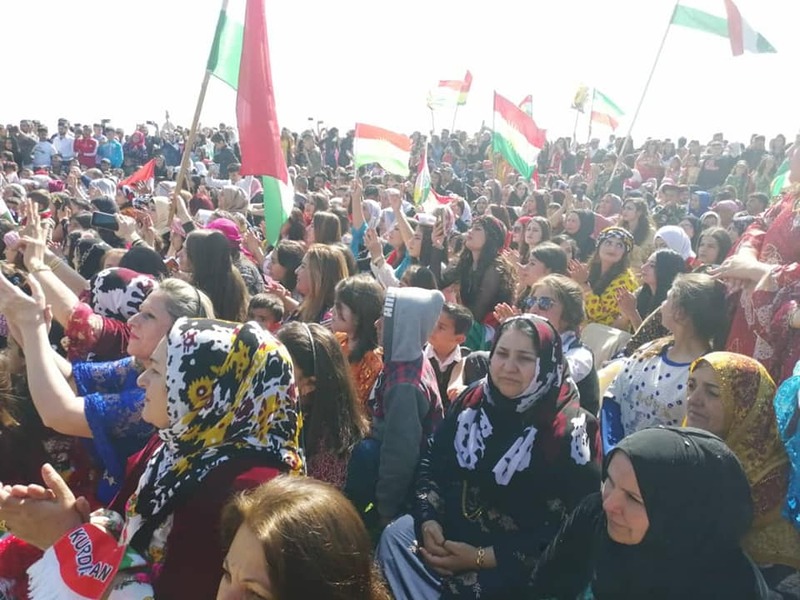 The Kurdish people celebrated the national day “Newroz” in Kurdistan Syria, in most of its cities and towns and villages on the line of its predecessors under the most oppressive dictatorships. The Kurds also celebrated in Kurdistan Region , Kurdistan Turkey and Iran. The “Aryan” peoples also celebrated the Asian and European continents in Iran, Azerbaijan, Afghanistan, Albania, Turkmenistan, the former Yugoslav Republic of Macedonia, Tajikistan, Kyrgyzstan, Kazakhstan, India and many countries in Central Asia. Day of Eid packed with the usual places to commemorate the national holiday Celebrators raising the flag of Kurdistan and pictures of Kurdish leaders on the line of the years were decorated in Kurdish folkloric uniforms, according to reporters Yekiti Media in most cities and towns of Kurdistan Syria. Our correspondents explained that in some areas the participation was intensive in other areas in the form of family or Rural areas gatherings according to the circumstances of each region, noting that the folkloric teams presented their offers in some areas. The United Nations Educational, Scientific and Cultural Organization (UNESCO) said in its window of events: “Eid Newroz – which was registered in 2009 on the Model List of the Intangible Cultural Heritage of Humanity as a cultural tradition celebrated by many peoples – is an ancient event that marks the first day of spring and the renewal of nature. It promotes the values ​​of peace and solidarity between generations and within families, as well as reconciliation and good neighborliness, thus contributing to cultural diversity and friendship between peoples and societies. In Afrin and despite the decision to prevent the celebration of the holiday by the Turkish authorities and local councils, celebrated the people of the region in spite of the difficult circumstances amid a campaign of raids and arrests by pro-Turkish faction militants . Kurdish students also celebrated Eid in Syrian universities, in the capital Damascus, in Lebanon and in other Middle Eastern countries.